Upon specification of your search criteria (pick-up/return location, date and time) in the above form, you will be provided with all our relevant and actual vehicle offers. If you wish to return a car in a different location than Tartu, please tick the 'Different Drop Off Location' check box. 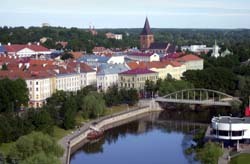 The most recent car booking in Tartu has been made on our website 718 minutes ago. In Tartu, we offer for rental 5+ car categories from 5+ rental suppliers. Budget rental. The most economical offers in Tartu are rendered for the following cases: (a) your pick-up date is 2-6 months ahead; (b) the same pick-up and return location and (c) a long-term rental (one week and longer). In Estonia, cars with a mechanic transmission and a petrol engine are less expensive than vehicles with an automatic transmission and a diesel engine. Reservation options. At your reservation time, you can additionally select a GPS navigator, child seats, winter tires, and many other convenient options. For most of the cars in Tartu, we will offer you a full coverage (zero franchise) insurance (full coverage of your risks, No Excess). Car pick-up. The rental office in Tartu will make the vehicle ready for you at the time indicated during your reservation. Upon arrival, you should show the required documents: your voucher, driving license and credit card. The rental office will provide you the keys, rental documents, and the invoice. Please check that all the data in the documents and invoice coincides with the data in your voucher. Safety. Have your rental papers with you during the whole rental period in Estonia, do not leave them in the car or at your hotel room. Keep car keys in a safe place out of reach of burglars in Tartu. In case of a car theft, your insurance will be invalid without keys provided. Car return. The final examination of the vehicle, final payment, and issuing of documents are performed in Tartu office upon the return of the vehicle. The fuel conditions (return with a full tank or an empty tank) are indicated in your voucher. OrangeSmile.com wishes you an exciting driving experience in Tartu! Next to the Town Hall Square is an interesting architectural structure, the Falling house. The building is tilted immediately after construction, but local residents have decided not to destroy it. Now the construction is carefully tended and restored. In a couple of minutes’ walk from the Falling house there is the Museum of Modern Art, which regularly hosts cultural events of different formats. The exposition of this popular museum changes several times in a month; works of beginning artists and photographers are shown and various presentations and competitions are held here. Not far from the center of the historic district is the most important religious landmark, the St. John's Church. It is amazingly beautiful building made ​​in a unique architectural style and featuring luxurious interior decoration. As many years ago, main ornaments of the church are exquisite terracotta statues. According to historical data, initially there were about two thousand statues, but after a century only several graceful figures have survived. The Tartu Toy Museum is the only one of its kind in Baltics. It would be interesting for both youngest guests of the city and their parents. A walk up the Toome Hill (Toomemagi) is very popular among fans of natural attractions. It is home to several prominent attractions such as the Dome Cathedral and the Museum of the University of Tartu.